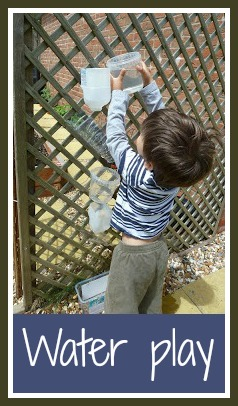 I spotted an idea for a garden water play structure on Pinterest fairly recently, and it stood out immediately because Harry has a fascination with water and pipes at the moment and it looked like a really fun activity that he would enjoy. The one that I have pinned is from Taming the Goblin and is based on an idea from Sun Hats and Wellie Boots. Both are far, far more sophisticated than mine! Luckily our recycling bin was full, so I was able to collect together a variety of different plastic bottles and pots. We have a trellis wall leading into our vegetable patch which was a perfect spot to use. I attached the bottles to the trellis using string and coated wire (cable ties would also have worked really well). I began with a simple top to bottom structure as it can be easily changed, and also it was more difficult than I had expected! The water had a habit of splattering off in unexpected directions. I think that perhaps I placed my bottles too far apart. This was really fun, and I'm looking forward to expanding and improving it over the summer! What a lovely idea for a sunny day. All sorts of possibilities there. I know, when it warms up again I'm hoping that we'll have lots of fun with it! Unfortunately we only had a brief window of opportunity before the rain started...but it's still there for another day! Yes, we have plenty of space and plenty of bottles, I'm hoping that I'll get better at the technique with practice! I'm intending to leave it out there all summer so that we can add to it and adapt it! what a fun activity... the kids would love it, and give me some quiet time!! Thanks for joining in with us!